Brussels Airport is continuously adapting its infrastructure, processes and products to meet the evolving needs of its passengers. In 2017/18, the Passenger Experience department of Brussels Airport had a particular focus on how to improve the security operating model to avoid queuing and thus reduce stress. Thomas Sterken, Capacity Planning & Optimisation Manager at Brussels Airport Company, tells us the successful story. “At Brussels Airport, we put our customers at the centre of everything we do. We want to understand our passengers by capturing their needs, wants and expectations. Besides an increasing number of passengers and new security measures in the past years, we have noticed a change in travel habits. Proportionally more passengers travel with hand luggage only, or larger hand luggage. 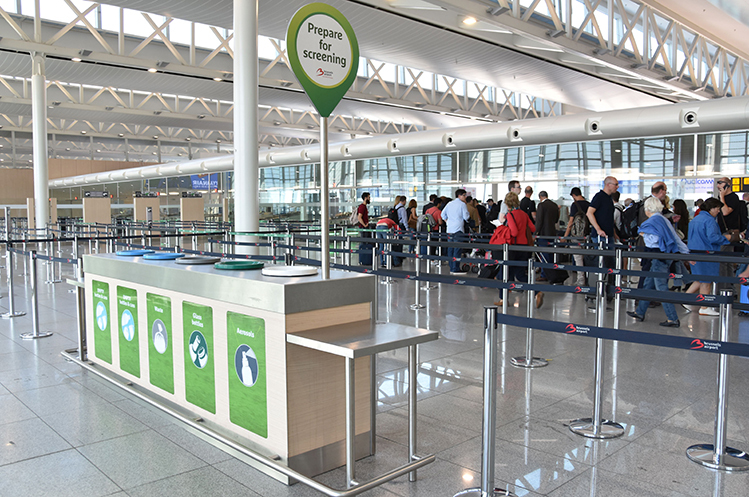 In order to keep up high quality standards and low queuing times at security screening, we wanted to rethink our processes,” explains Thomas Sterken, Capacity Planning & Optimisation Manager at Brussels Airport Company. Brussels Airport has two security screening platforms, one for departing passengers in Connector and one for transfer passengers. 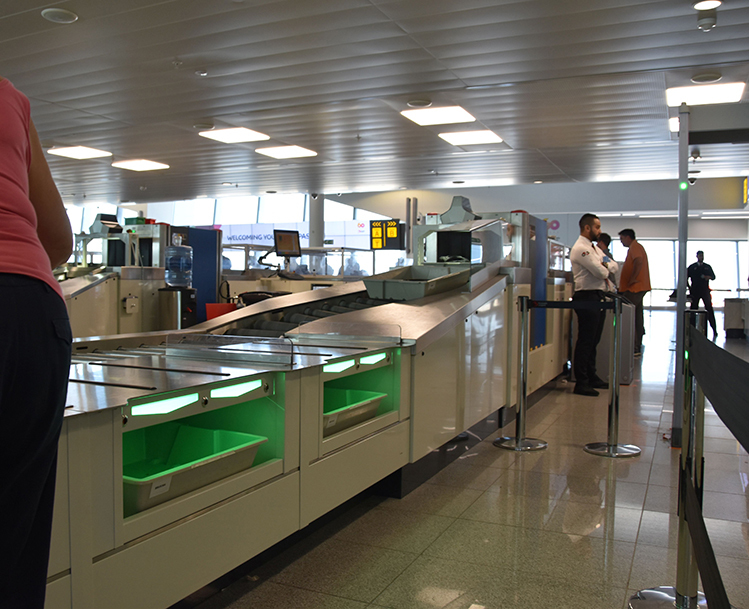 The direct departures area has 25 automated tray return systems supplied, whereas the transfer area has 6 lanes of a more traditional, manual roller system. In order to create a successful programme, the Brussels Airport team engaged a number of stakeholders: G4S (the outsourced security provider), Result (the leading consultancy in optimising security check-points & e-gates), Fabricom (Engineering partner to Brussels Airport), Vanderlande (Automatic Tray Return System supplier), and Scarabee (architects). Brussels Airport has two security screening platforms, one for departing passengers in Connector and one for transfer passengers. 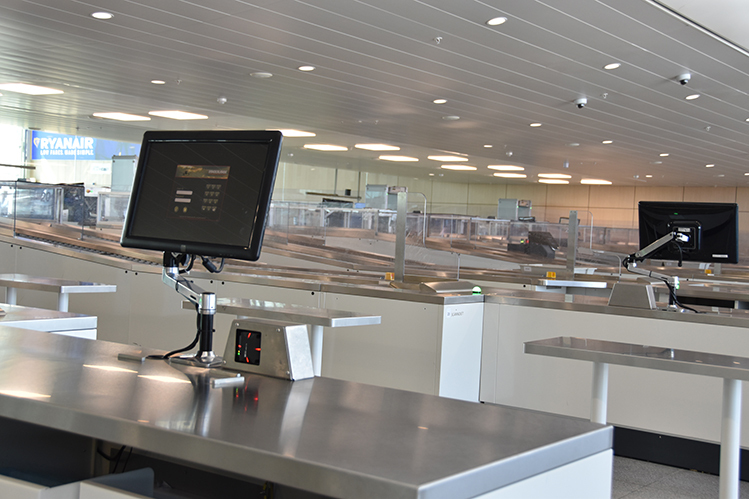 The direct departures area has 25 automated tray return systems supplied, whereas the transfer area has 6 lanes of a more traditional, manual roller system. or a procedure, we evaluated its added qualitative and quantitative value,” Sterken explains. At the transfer area, a series of carefully controlled and designed trials were introduced with Rapid-FloTM and Rapid-PakTM, systems (Parallel loading and repack tables), both products of consultancy agency Result. Where infrastructure was changed, ergonomic studies were undertaken to ensure staff safety would not be compromised. Trial staff were briefed and coached in new ways of working and updated standard operating procedures to assist the officers. In the Connector area, before starting trials, simulation models of architects Scarabee were used to understand possible bottlenecks in the Automatic Tray Return System and check the impact of possible changes. Diagnostic showed that by introducing ‘parallel loading’ at divestment and changing the operating model, the screening throughput (and efficiency) would increase along with the passenger experience. These concepts were also trialled and later applied at the transfer area. During trials, the added value of each position manned by security agents was assessed. In the Connector area, before starting trials, simulation models of architects Scarabee were used to understand possible bottlenecks in the Automatic Tray Return System and check the impact of possible changes. Diagnostic showed that by introducing ‘parallel loading’ at divestment and changing the operating model, the screening throughput (and efficiency) would increase along with the passenger experience. “Already during trials, we took the time to train, coach and invest in staff, so we could learn from them. Team leaders were involved rather than trainers. Each trial phase was carefully monitored and data analysed against baseline levels,” Sterken states. Following the success of the trials, multi-divestment was introduced at the transfer area screening platform, alongside an extended reclaim belt to give passengers more time to pack after screening. A new operating model was also adopted across the 25 search lanes at the Connector area: parallel loading, the introduction of a passenger facilitator at the beginning of the screening lane and a support agent at the back. A programme of staff training, coaching and auditing was implemented, led by a Brussels Airport team with all stakeholders contributing to the delivery. Over 800 staff were trained, coached and monitored in the new ways of working. The technical delivery was performed in 7 weeks and supported the delivery of the modified Automatic Tray Return System equipment and snagging. Introducing passenger facilitators and support agents at the screening lanes, alongside parallel loading and multi-divestment also increased efficiency (passengers processed per officer) and throughput. The life expectance of the infrastructure was extended with 3 to 5 years. For more information, please contact Thomas Sterken, Brussels Airport Company (thomas.sterken@brusselsairport.be; +32 (0) 753 41 84).